But then something changed and I'm not going to lie...I kind of dig it. Kanye starts things off with, spitting some cocky rhymes before Katy chimes in with the version of the song we all know and love. 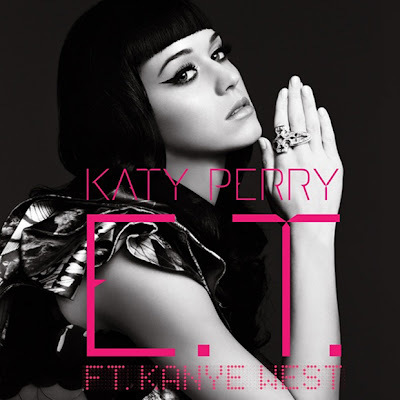 While Kanye does come back for seconds later on in the song, I still think that Perry sells the hell out of this song - from her sassy-staccato delivery throughout the song, right down to the infectious chorus. While I secretly wish "Peacock" was getting an official single release, "E.T." is definitely growing on me as a single choice. The song was written by Perry along with hitmakers Dr. Luke, Max Martin and Ammo, the same guys responsible for the production. "E.T." is Perry's fourth single off Teenage Dream and will be released in the US on February 18th and on February 27th in the UK. The video, which features Kanye West, was directed by Floria Sigismondi, an accomplished photographer/director who's worked with everyone from Fiona Apple and Björk, to Christina Aguilera and Marilyn Manson. Sigismondi also recently directed The Runaways which starred Kristen Stewart and Dakota Fanning. I have high hopes for this one! Perry's Teenage Dream album, the second of her career, was released last summer on Capitol Records and has been blowing up ever since. The album debuted at #1 on the Billboard 200 and UK Albums Chart and went all the way to the top in six other countries as well. Perry is about to embark on a MASSIVE international tour in support of the album, starting February 20th in Spain. She'll be back in the States in the summer, but definitely check out Perry's official site for more information and specific tour dates. In the meantime, check out some info about the "E.T." remix package HERE, listen to the single below, the just released artwork above and download Teenage Dream on iTunes HERE. **EDIT** The single appears to be available for download in the States now. Get it HERE. While I could waste your time posting Teasers #11, #12 and #13...WHY BOTHER? Britney Spears released a 30 second teaser of the Jonas Åkerlund-directed "Hold It Against Me" video and it looks A-M-A-Z-I-N-G!!! Fierce dancing? CHECK. Fierce costumes? CHECK. Britney looking all around FIERCE? CHECK! (sorry - I'm banning the use of the word 'FIERCE' starting now). Britney's back in all her glory. Per a recent Tweet from Adam Leber, Brit Brit's manager, the video is set to premiere tonight at 9:55 PM ET/PT on MTV. Look out for it folks. I think we're talking EPIC. Download "Hold It Against Me" on iTunes HERE. In the meantime, check out 30 seconds of bliss down below.